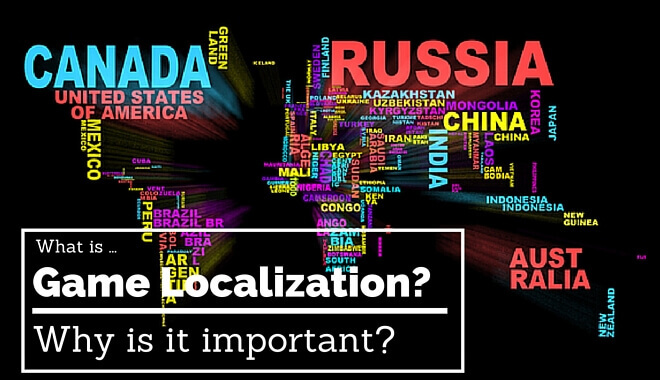 What is Game Localization & How Does it Affect Designers? If you’re located in the US, you might have noticed that an interesting thing happens with the video game release dates. A US-based game studio typically releases to the US several weeks earlier than it releases to other parts of the world. Maybe you never thought much about that, but there’s a good reason why. Game localization is the act of preparing games for their respective releases in different areas of the world. Different areas speak different languages, have different cultures, and have different content and censorship laws. Game localization allows developers to tailor the game experience to match the audience for which it’s intended. What does that entail? Game localization involves everything from the obvious, like translating the game into new languages, to the less apparent aspects, like removing elements from a game that other cultures might not tolerate in their entertainment content. Let’s start with blood and gore. In the United States, it isn’t uncommon for a game to have an option to reduce or eliminate the amount of gore and blood shown in the game. There might be an option to turn the blood a green color, or just remove it entirely. The point is, in the United States gore is allowed, and the game is just given the corresponding ESRB rating. However,In the U.S. it is unlawful to sell an M (for “Mature”) rated game to anyone under 17 (and in some cases 18) years old. In other parts of the world, “M” rated violence might not be acceptable at all. Australia, New Zealand, and South Korea are known for watching that element of game content closely. Since extreme violence can potentially inhibit releases, game developers need to know what content is acceptable for which locations. Then, instead of providing options to reduce gore, they could lock it out entirely for their Australian and New Zealand versions of the game. In order to tap into the international market, you have to tailor your game experience to fit the wants and needs of gamers on a global level. Why, do you ask? Well, picture yourself playing your favorite video game on a current generation console. In an effort to avoid playing console/PC favorites, we’ll use Fallout 4 as our example. As you play through in the United States (in real-life, not wasteland-life), the English matches up perfectly with the characters and their interactions. The quests from your Pipboy all make sense to you, grammatically and otherwise. All communicated text comes through as intended, and you’re never confused about what it is you’re supposed to do next (barring the indecision that comes with the massive scope of games like this, paralyzed by overwhelming opportunity!). It’s a perfect world. Now, imagine instead that you live in Brazil and speak Brazilian Portuguese. You get a US copy of Fallout 4. You are going to be significantly less engaged. You won’t understand any of the nuances that make the game such a wonder to play. You’ll be able to get through quests with the help of the Pipboy quest markers, but you’re less likely to feel satisfaction at completing these quests. You won’t understand any of the pieces as you put together the wasteland puzzle. That is why game localization is important. It lets people in all different parts of the world experience the game as it’s meant to be played, in a way they can understand and appreciate. As we touched on above, if developers are looking to release games internationally, they need to be aware of the censorships and nuanced content rules for the global markets they want to target. These restrictions can affect designers in a number of ways. Typically there are two ways to go about an international release. There’s the simultaneous shipping method, and there’s the post-gold localization method. The former is an option frequently pursued by AAA games. It involves a lot of planning ahead of time, as the localization process (translation, foreign voiceover, and content changes) needs to begin in the last 4 months of the game’s development. This means the localization is happening at the same time as the home-stretch production of the primary market version. Post-gold localization means the game has already been released in its primary market, and the game is retroactively adjusted for shipments to new international markets. The localization process means some extra work for game designers. The best approach is to stay organized by separating the elements that will need adjustments during localization. In many cases, studios will hire localization project managers. The PM is tasked with keeping all facets of localization running smoothly. If you’re interested, check out Gamelocalization.net for a more comprehensive list of internationalization issues. Here’s a potentially valuable PDF with some additional tips to get you started. It’s likely that the effort behind a global game release never crossed your mind. It makes sense that a game would need to be translated, but to have to adjust the content too? Insanity! Localizing a game correctly takes some extra work, but if you have a great product that international audiences will enjoy, it could be a rewarding endeavor.